Moser’s original planetary display of hours and minutes is revisited in two limited editions, one with a mysterious blue glow. 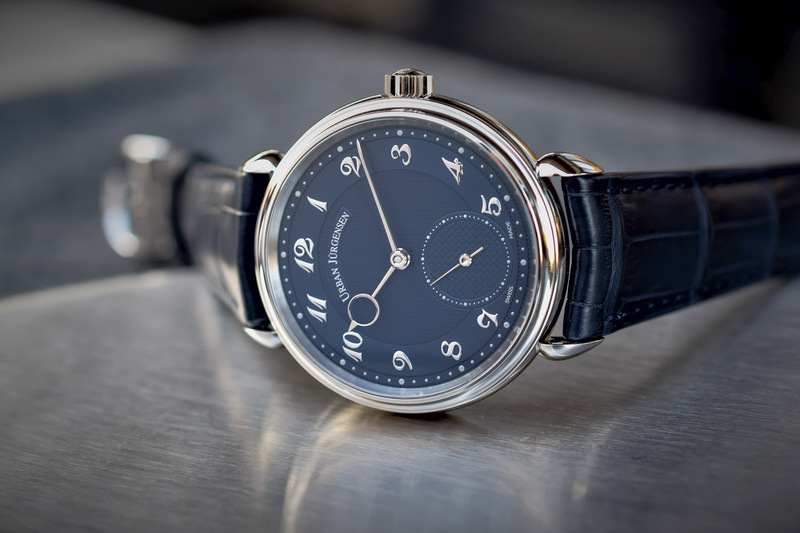 H. Moser & Cie. released the Endeavour Flying Hours in 2018, offering a refreshing and contemporary take on a planetary display and the brand’s first foray into non-traditional time representation. Acclaimed for its ability to reinterpret complications in ingeniously simple ways and stage them in dramatic, minimalist settings, Moser’s take on a planetary display of hours and minutes was original and very in tune with the brand’s DNA. 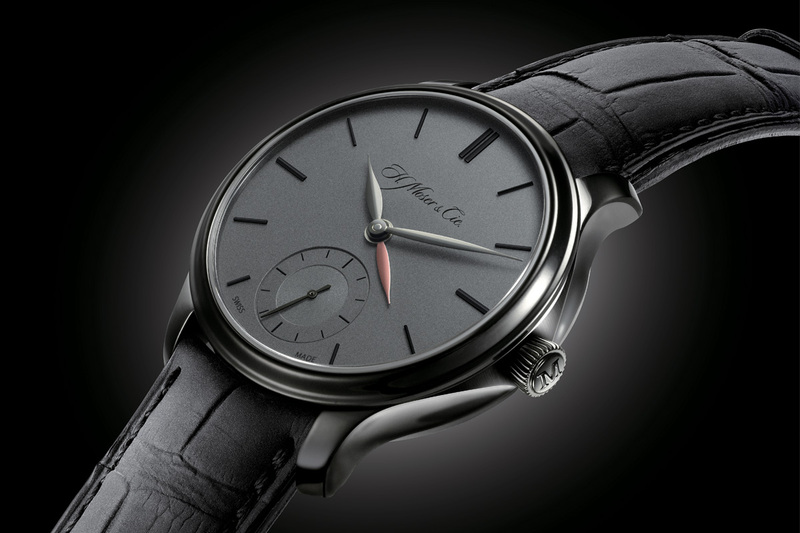 Although all 60 pieces of the original limited edition were sold out during the SIHH 2018, some criticised the legibility of the watch (more on this later). 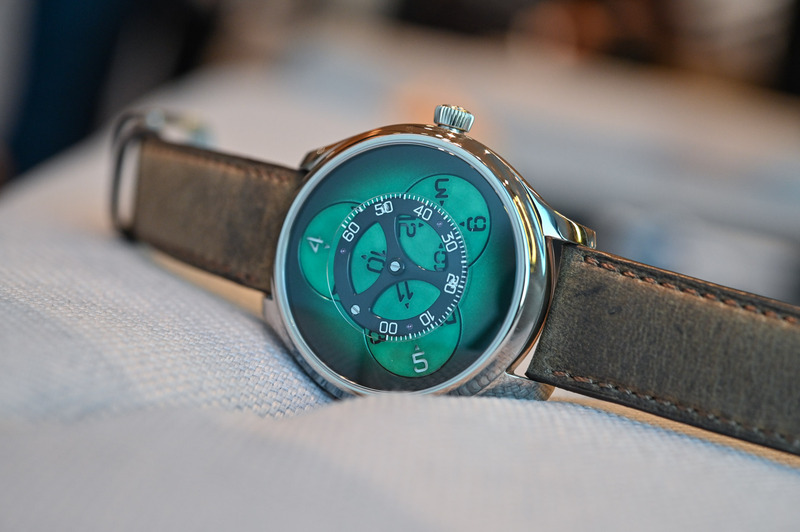 During the 2019 watch fair in Basel, Moser introduced two new white gold limited edition models of the Endeavour Flying Hours, one with a hallmark Cosmic Green dial and the other with an intriguing blue dial featuring a novel material known as Globolight XP© that makes the three hour discs glow in the dark. 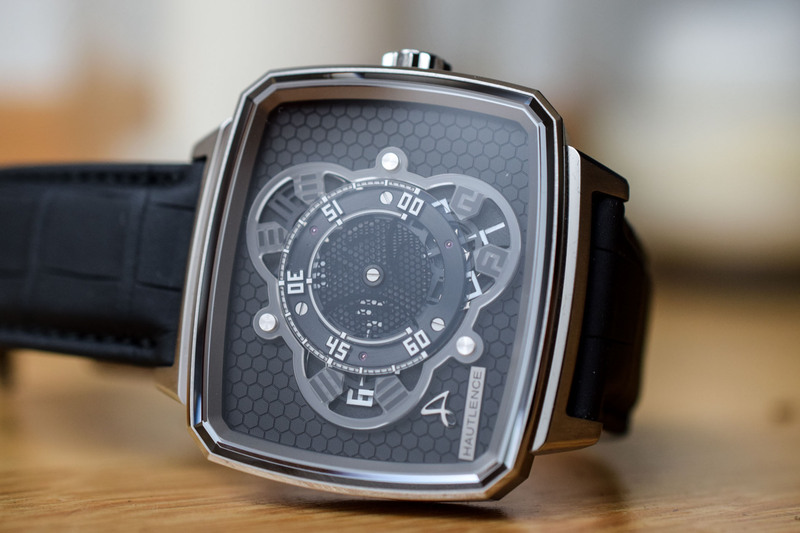 As all our MONOCHROME readers know, H. Moser & Cie. and Hautlence are sister companies of MELB Holding (led by Georges-Henri Meylan) and enjoy a two-way exchange of technology that benefits each brand mutually. To be precise, it is a three-way exchange; MELB Holding also has Precision Engineering AG, a manufacturer of escapements and balance springs, under its belt. 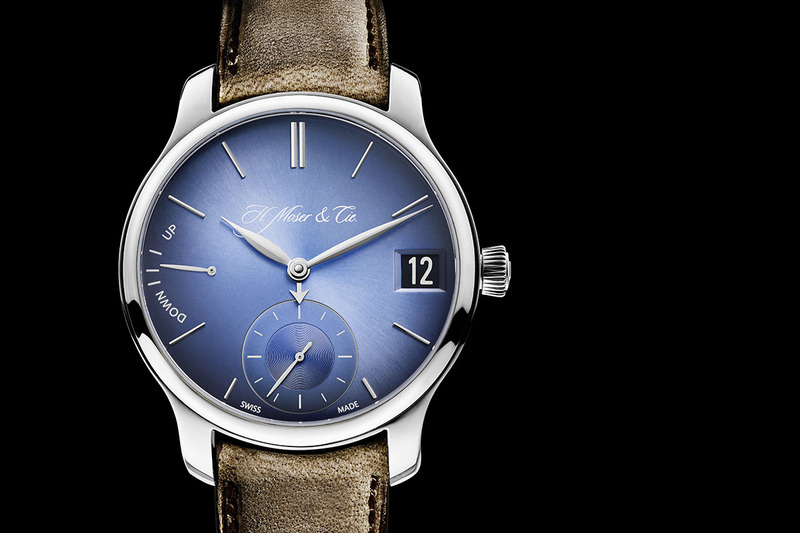 The HMC 806 calibre powering the Endeavour Flying Hours exemplifies the synergy between Moser and Hautlence today. 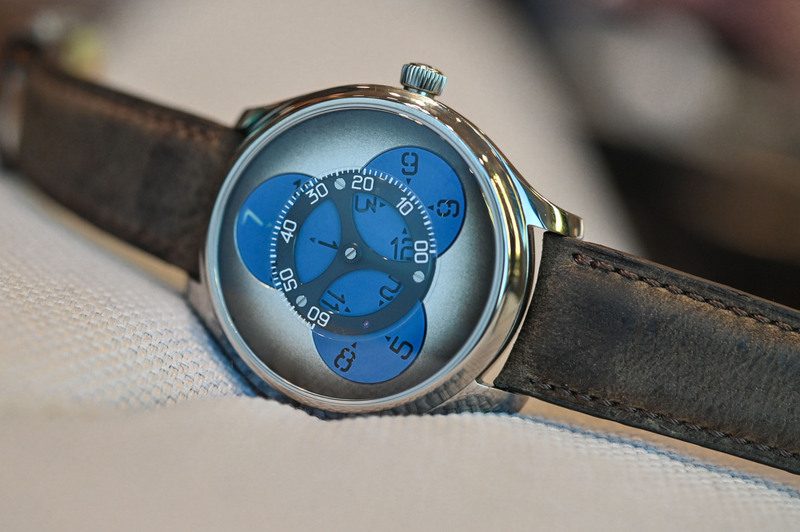 Based on Moser’s automatic calibre HMC200, Hautlence was in charge of the modifications for the planetary display. 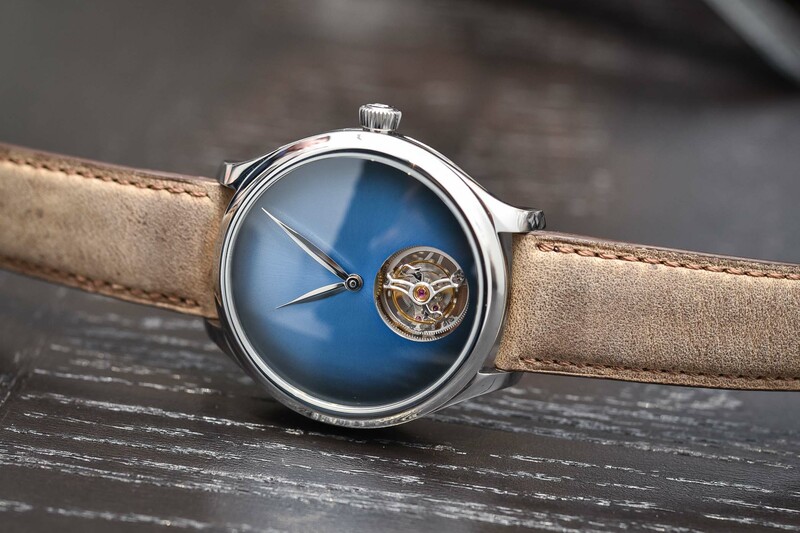 What is interesting to note is that both companies adopted the technology in 2018 to produce planetary watch models – albeit with different calibre names and as different as chalk and cheese. 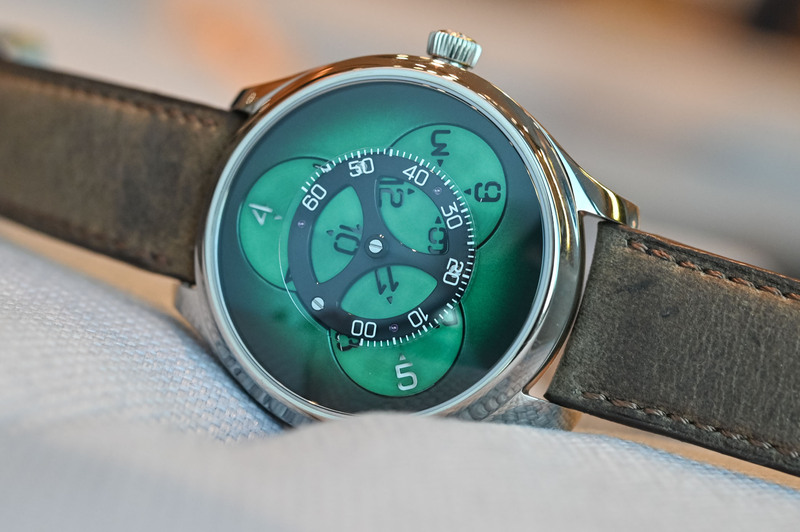 Moser came out with the Endeavour Flying Hours and Hautlence with the HL Vagabonde 01 & 02. It’s clear that both the Moser and Hautlence models performed well enough to reappear for an encore this year with the HL Vagabonde 03 and Moser’s Endeavour Flying Hours in two different colour schemes. 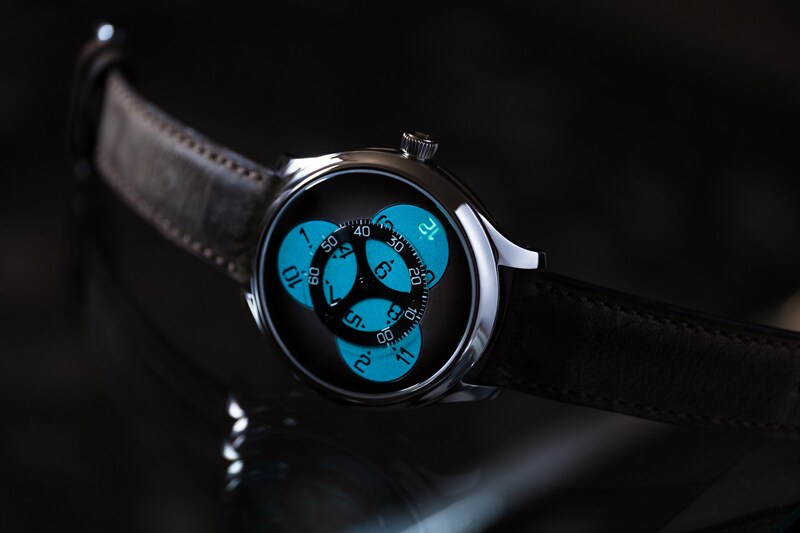 The layout of the dial is identical to the 2018 Flying Hours model and features a central disc in sapphire crystal to display the minutes with three discs for the hours arranged underneath it. Unlike most orbital hours that point to a fixed minute scale positioned below the rotating hours, all four discs of the Endeavour are in motion. The three hour discs with four cut out numerals on each disc (1,4,7,10 – 2,5,8,11 – 3,6,9,12) are mounted on individual axes and rotate on their own axis thanks to planetary gears mounted on star wheels. To consult the current time, the corresponding hour numeral is highlighted with a white background. The minutes, placed in the centre and held in place by a trispoke bridge, are displayed on a 240° sector and indicated by the small arrow at the top of each hour numeral. Now, let’s tackle the issue of legibility. 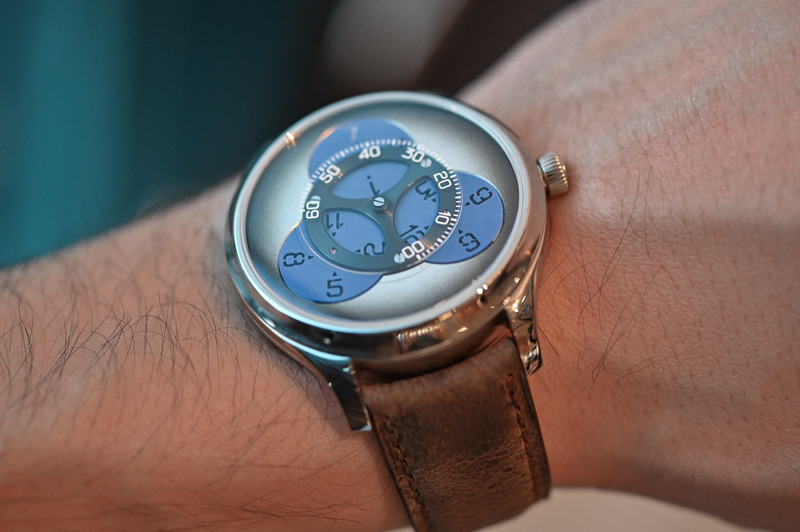 You have to get used to reading this watch because, at first glance, it can be quite confusing. For one, the hours are not placed intuitively and the current hour does not pop up in a fixed position on the dial. You have to hunt down the hour marker displaying a white background to establish the hour and, in certain light conditions, it is not always easy. There is another slightly confusing element to take into account; as the current hour surrenders the stage to the following hour, a period of 10 minutes elapses when both the preceding and succeeding hours appear simultaneously on the dial. That means that for 10 minutes two numerals appear with white backgrounds. I realise this overlap might have its detractors but once you overcome the ten-minute no man’s land, consulting the time becomes much more intuitive. If you think about Moser’s provocatively naked Concept watches, in particular the amazing Endeavour Concept Minute Repeater Tourbillon that wowed the crowds at Basel this year, you will agree that Moser’s watches are more about the spectacle, the artistry, the aesthetics and the pleasure of wearing a beautifully executed and original timepiece than providing atomic to-the-second precision readings. 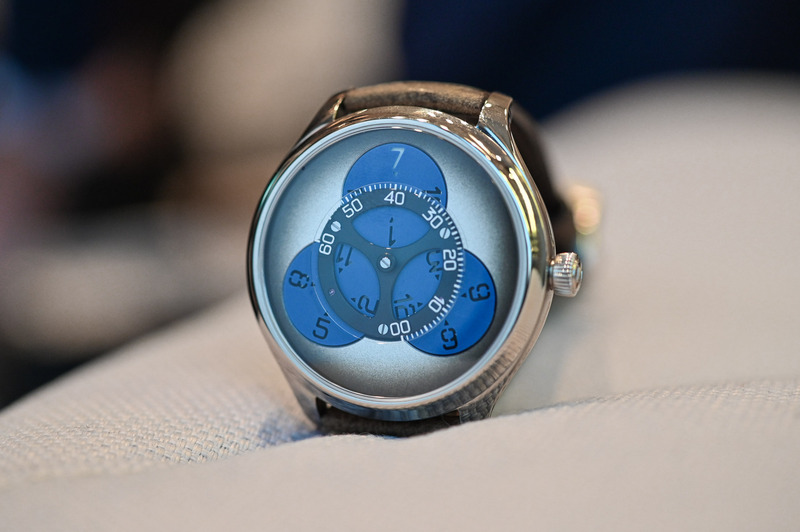 Which is not to say Moser’s watches are not precise… far from it, but that is another article in itself. 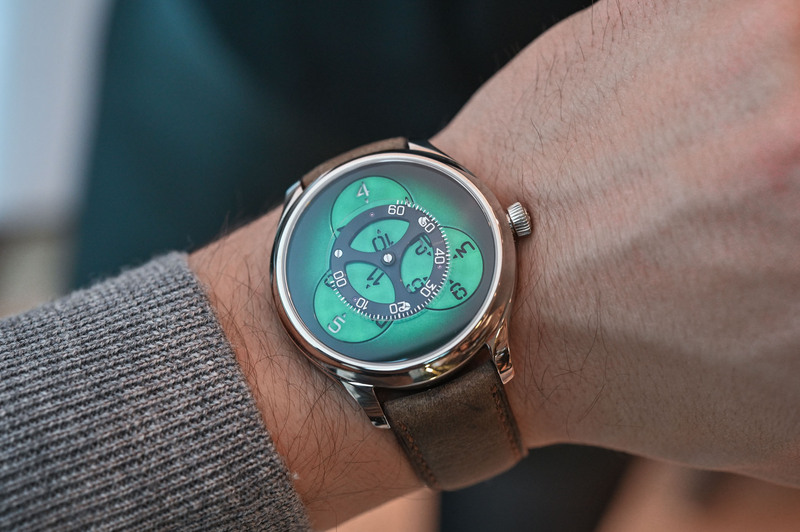 The 2019 models of the Endeavour Flying Hours are launched in a signature Moser Cosmic Green fumé dial and a Superluminova Blue model, which also has a lovely fumé background. 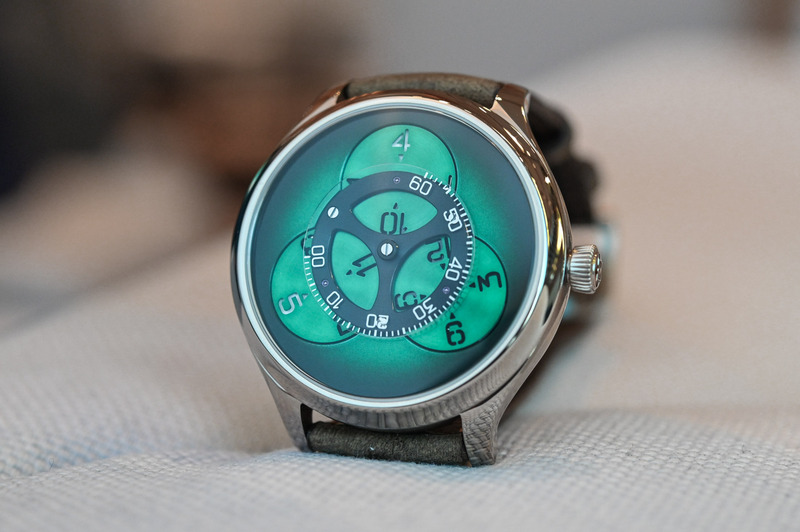 The blue model represents more of a novelty than the Cosmic Green because of the incorporation of an innovative material treated with Super-LumiNova that emits a phosphorescent blue glow. 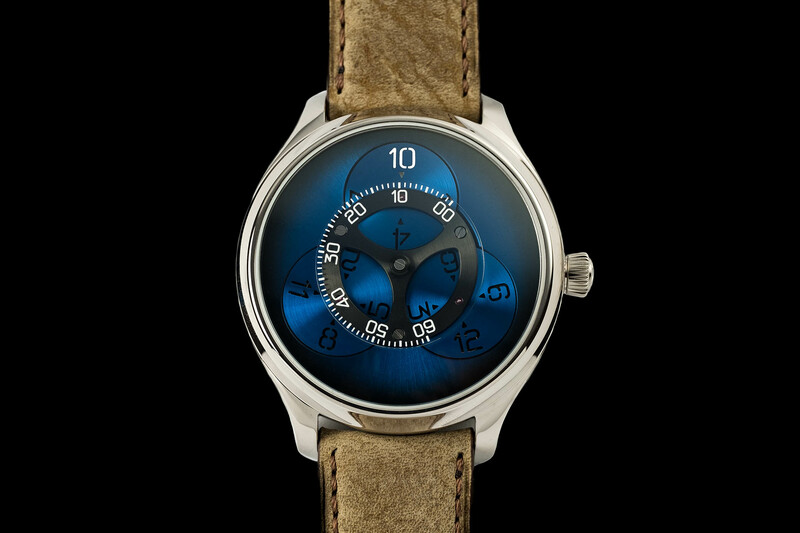 To improve the legibility of the watch in poor light conditions, Moser has taken on board a cutting-edge material made by Xeno Print to endow the Superluminova Blue model with an enduring glow. Globolight XP© is a luminescent material (not a paint) that can be cut into all kinds of shapes and sizes: numerals, markers, base plates, chapter rings, crown rings, hands, balance bridges etc. for appliqués on watch dials and even movements. Patented by Zeno Print AG in 2016, not only can Globolight be cut in an infinite variety of shapes, it is treated with Super-LumiNova to offer a wide variety of luminous colours and a choice of light intensity. The three hour discs on the blue model change dramatically according to the light. 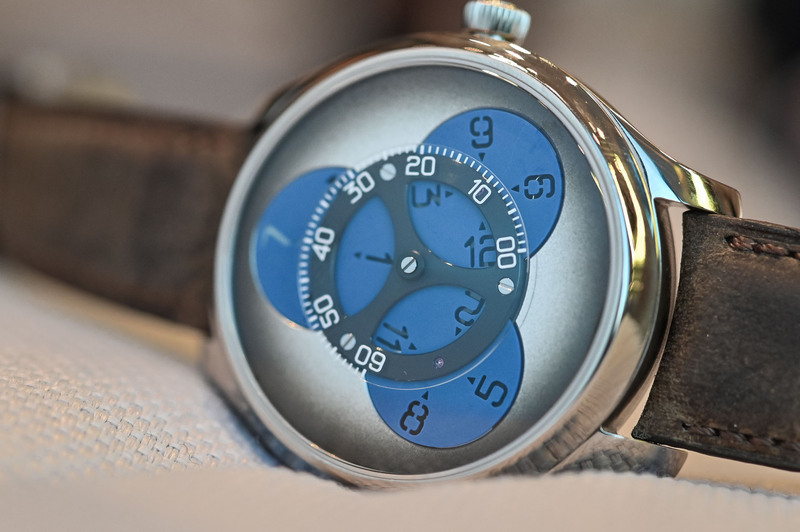 In daylight, the discs have Moser’s signature Funky Blue colour, but when the light dims, the hour discs and the numerals on the minute track put on the Globolight show. 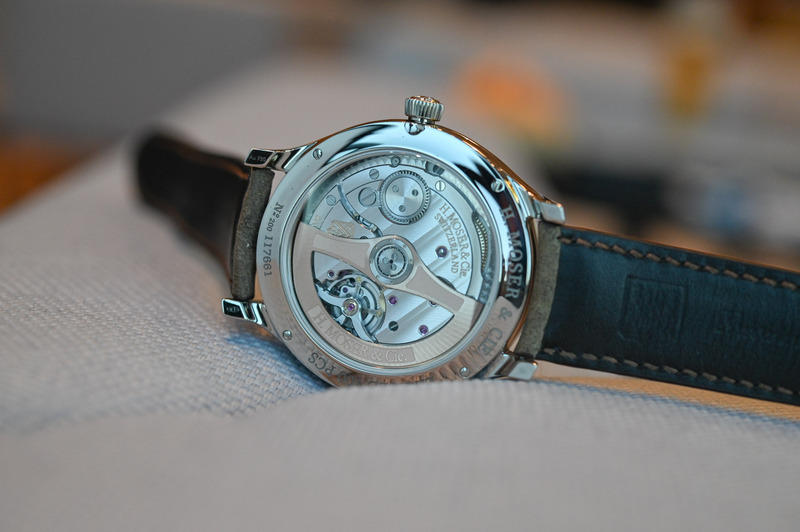 Both models are housed in 18k white gold Endeavour cases with a diameter of 42mm and a height of 12.3mm. The fluid contours of the case are finished with brushed and polished surfaces and the slight curvature on the back and short sloping lugs allow the watch to sit perfectly on the wrist. 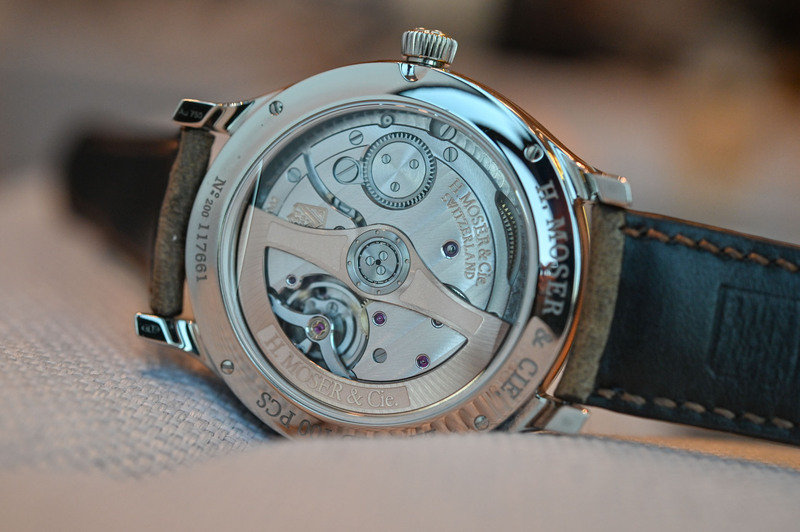 The movement is the same as the one used in the inaugural 2018 model and is based on Moser’s automatic HMC 200 calibre with a central red gold rotor. Hautlence modified the movement by changing the traditional central triple-axle into a series of star wheels and the calibre was renamed C806. The very same calibre, renamed HTL 205-1, is used to power the Hautlence Vagabonde although the differences can be appreciated in the finishes and on the oscillating weights. Another feature of the C806 is the bi-directional winding system powered by a solid red gold partly skeletonised oscillating weight offering a power reserve of three days. The escapement and hairspring are also produced ‘in-house’ by Precision Engineering AG. The finishes on the movement are beautiful, including Moser double stripes on the bridges, circular graining on the base plate and bevelled and polished edges. As a fan of the brand, I have to admit that the Endeavour Flying Hours did not appeal to me with the immediacy of other Moser models. However, taking time to decipher the layout and its idiosyncrasies became part of the fun. The fact that the hours appear in unusual places around the dial – and the even more disconcerting appearance of two distinct hour markers during the 10-minute transition stage – adds complexity and personality to the watch. Obviously, at CHF 35,000, this is not a watch for the uninitiated but will appeal to collectors who enjoy Moser’s refreshing, contemporary and beautifully executed take on classic watchmaking. The Endeavour Flying Hours Superluminova Blue and Cosmic Green models come with hand-stitched alligator leather straps with an 18k white gold pin buckle. They are limited editions of 100 pieces each and will retail for CHF 35,000. For more information, please consult www.h-moser.com. Just because you can do something does not mean you should. What a pointless waste of CHF35,000 buying one of these would be. 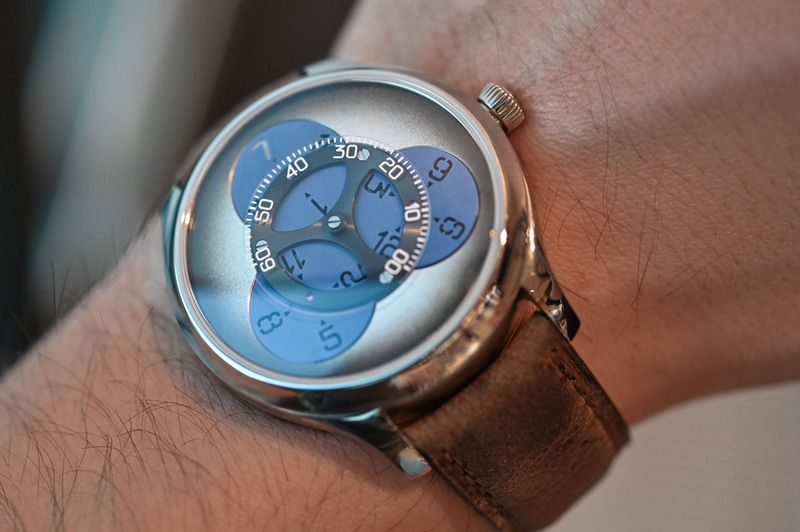 Nice movement; ugly, inelegant watch dials. What a shame. Really really ugly. Wouldnt buy one for 100 euros. What a shame Moser watches became so ugly. The earlier models are magnificent. Hopefully they will realize this and revert back to older models.